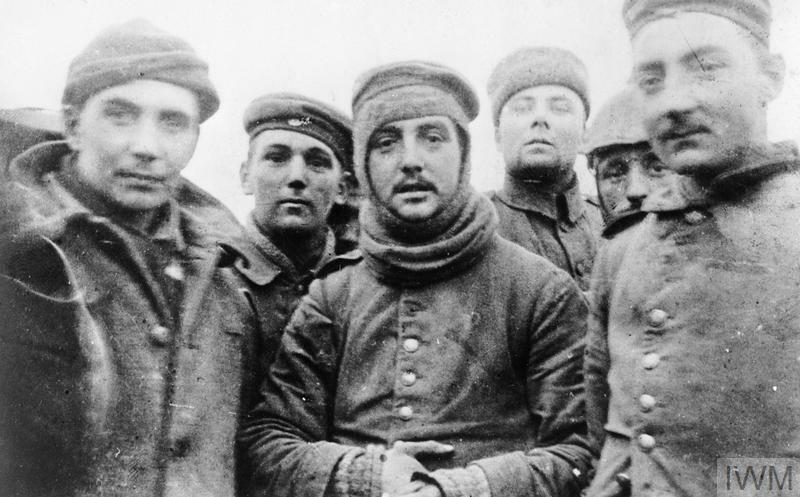 THE CHRISTMAS TRUCE, 1914 (Q 70074) British and German soldiers fraternising at Ploegsteert, Belgium, on Christmas Day 1914, Front of 11th Brigade, 4th Division. Copyright: © IWM. 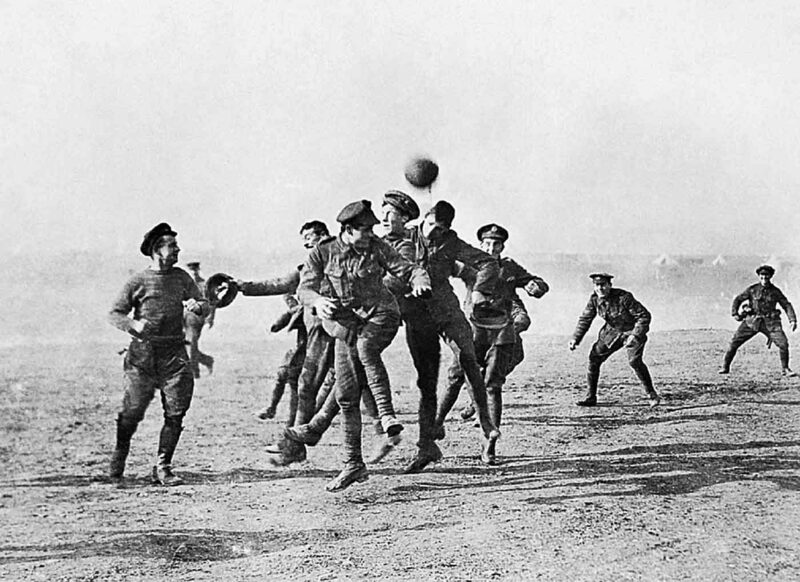 Have you ever heard about the Christmas truce that occurred during World War I? The fields of Flanders were no place to be on Christmas Eve in 1914. The air was cold and frosty, of course, because it was winter, and things were very quiet. 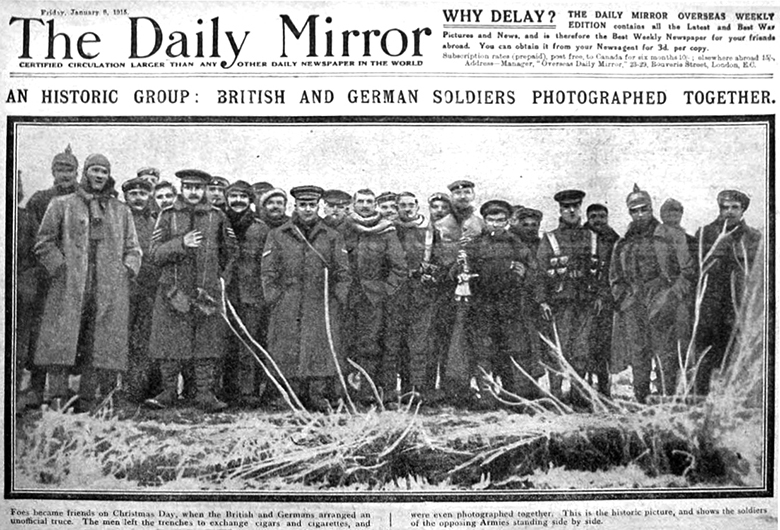 Thousands of British, French, Belgian and German troops were dug-in and planning yet another day’s carnage. None of them would have guessed that the “War to End All Wars” would continue nearly four more years and ultimately cost more than eight million soldiers’ lives. So, when the entrenched British soldiers saw candle-lit decorations emerging from the enemy’s foxholes and heard the strains of faint melodies being sung in German they thought their enemies were taunting them and prepared to open fire. German soldiers were raising their voices to sing “Stille Nacht, Heilige Nacht”… Suddenly, one of the British soldiers recognized the melody and started singing too — the same song that the Germans were singing — only in English. 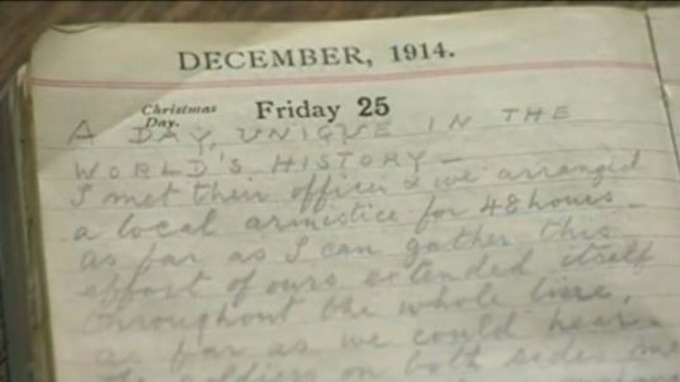 When the hymn “Silent Night” ended, the British soldiers replied with “The First Noel”. Back and forth, the singing went on for about an hour. Then there were voices of invitation to cross over to enemy lines. One German with great courage started walking across the “no man’s land”, and was soon followed by some of his buddies, all with their hands in their pockets to show that they had no weapons. For the remainder of that night and much of the next week the war stopped, as the both sides lay down their weapons and lifted their 18-20 year old voices to sing familiar Christmas carols in their own languages. They shared pictures of their families “back home” and even shared provisions. An amazing spirit of peace fell over the battlefield that night as war gave way to peace in the Spirit of the Christmas child whose coming had been foretold by Isaiah. By New Year’s all sides would be back to killing as usual but, for a brief moment, peace came to one of the bloodiest conflicts in human history. That same Christ still offers peace to the bloodiest of conflicts in our lives. As far as I am concerned this was a miracle even if it was short-lived. Today, I think about the ways I need the Prince of Peace (Isaiah 9:6) to enter my life. Not just calling for a temporary truce but lasting peace in my life and in the world. If God did it once, it can happen again. As we approach 2019 let us pray for peace in our lives and peace throughout the world. Amen. Amen. I was familar with this story but did not know that the peace between them filled several days. How heavy the young mens’ hearts must have felt when it had to end.